Invisalign is an appealing option for many adults and teens who want straight teeth without obvious metal braces. 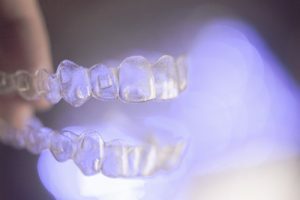 If you are a good candidate for Invisalign braces, there are a few things to understand about this orthodontic method, including the little-known Invisalign attachments. Invisalign aligners are powerful. They move teeth and the roots of teeth over weeks and months of treatment. In some cases, the aligners do not work alone. Little buttons known as attachments are sometimes a necessary part of Invisalign. They enable the aligners, which sometimes cannot accomplish alignment changes on their own because of the size, shape, or angle of a specific tooth, to move with a little extra force to shift teeth into their proper locations. The attachments are tiny. Invisalign attachments are little, tooth-colored dots made of composite filling material that are bonded to teeth to help the Invisalign aligners move teeth. Location matters. The attachments are usually placed around the middle of the tooth, serving as an anchor to make an aligner work more effectively. Shape can vary. An attachment can be circular, square, rectangular, or triangular. The type of attachment you receive depends on the goal that is trying to be achieved, like tooth rotation, intrusion, or extrusion. Attachments have an important job. Attachments serve as anchors for your aligners, allowing the aligners to fit more snugly against your teeth and move more effectively. When your teeth shift into alignment the way they’re intended, your treatment with Invisalign braces will proceed smoothly, and you’ll have perfectly straight teeth before you know it. Attachments can sometimes be annoying. Because attachments click into the aligners at designated spots to create more secure trays, putting in your aligners takes some precision. You won’t just be clicking Invisalign in and out on a whim. Some patients complain that attachments are irritate their mouth when their aligners are out, while others dislike that food builds up around the attachments during meals (you need to be diligent about cleaning the attachments and your teeth after every meal and before aligners are put back in place). Not every tooth needs an attachment. The number of attachments you need will be determined by your Center City Invisalign provider at the start of your treatment. If you do require attachments for certain teeth, the buttons may not be necessary for the entirety of your treatment. Sometimes attachments are obvious, sometimes they’re not. If you need attachments on your front teeth, they’ll be more noticeable than on other teeth. Your Center City Invisalign provider will match the shade of the buttons as closely to your natural tooth color as possible so they blend in with your teeth. Adding attachments is simple. The surface of your tooth is prepped for bonding, your orthodontist will use an Invisalign template to mark the locations of the attachments, fill the template, then cure the bonding so the tiny bump hardens and stays in place. When you no longer need the attachments, they will simply be buffed off your tooth. You may not need any attachments at all. If your treatment plan is straightforward, and the Invisalign aligners can do all the alignment work on their own, you may never need attachments on your teeth. Attachments make Invisalign possible for more patients. If you’ve been told that Invisalign could never work for your complicated alignment problems, that isn’t always the case. See an experienced Center City Invisalign provider to find out for sure. Attachments can help aligners achieve tooth movements that would not otherwise be possible with Invisalign. If the thought of attachments has put a damper on your excitement about Invisalign, don’t let it. Remember, Invisalign is difficult to see. They’re nothing like the brackets of traditional metal braces. Your attachments will be hidden by your aligners most of the time, and they will make your orthodontic treatment more effective and, therefore, faster. Find out if you or your teen are good candidates for Invisalign braces. Make an appointment with Dr. Roberts or Dr. de Marsche at our Center City, Philadelphia or Lawrenceville, NJ, office.